The Minneapolis Park Board received a $150,000 Hennepin County Youth Facilities grant award to rehabilitate Morgan and Loring courts. $15,000 USTA Northern grant funding awarded to the Morgan Courts project. $5,000 Washburn Foundation grant funding awarded to the Morgan Courts project. $27,000 in private donations from individuals and supporters of Morgan Courts project. 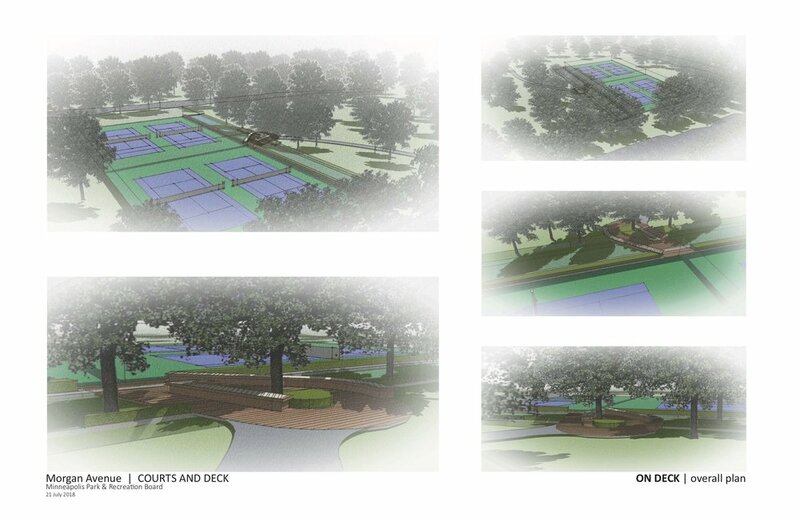 Landscape designers and architects have created preliminary draft plans for both sets of courts. While these are not finalized, they suggest a vision for these courts and their immediate surroundings. News and up dates are available to registered members. So join for free and gain access to what is happening in regard to the park tennis courts. We will fill you in on the processes of the Park Board as they relate to tennis courts. We will suggest effective ways in which you can express your support and concerns regarding court maintenance to appropriate park administrators. Coming soon we will offer a public tennis court forum. So register — it’s free.